This article gives you information about utility companies and their services. Bills for utilities may be paid direct to the company office, by sending payment through your bank (heriot kever), online, by credit card or through the post office. Gas and electricity are normally billed bi-monthly. Water is metered in Israel and usage is charged by the cubic meter. Each person is allocated, at present, 18 cubic meters of water per month, charged at the basic rate. If you use more than this there is a new government "drought tax" which charges you exponentially. To be charged correctly, take everybody's, including children's, teudat zehut to the water company, which here in Safed is Peleg HaGalil. The water company will then register the size of your household and tell you how much water you can use per month. If you use more you will be subject to the drought tax. Water prices are scheduled to rise by 40%, in steps, by 2011 as part of a government measure to get people to save water. So keep your bill down by attending to any leaks, dripping taps and so on straight away. If you have a major leak, burst pipes etc call the plumber and/or the water company to sort it out, to avoid a huge bill. The water bill comes with your arnona bill, (city taxes) and you can pay for it at the arnona office. 08.30 -13.00 Wednesday & Thursday. Friday closed. There are three main gas companies in Safed - Amisragas, Pazgas and Supergas, so see which company is best for you. As well as mains gas, there is also bottled gas or "gas balloons". 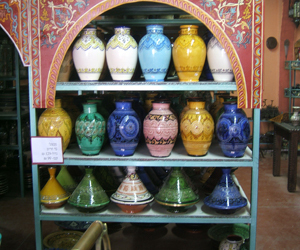 These are the metal gas canisters of various sizes that you can see outside buildings around Safed, especially in the Old City and the Artists Quarter. If you live in an apartment building that has mains gas, the vaad bayit (building committee) normally decides which company the building uses. If you have your gas from balloons you can order by telephone and the company will deliver either one or two balloons to your door, and switch them for you. Don't forget to monitor your gas use so you know when to reorder. You don't want to get caught without gas just before Shabbat or a major festival! Many people only switch one balloon at a time, so they always have one full balloon waiting. Electricity in Israel works on 220/240 volts and 50 Hz so don't use an American 120 volt appliance without a transformer, as you will permanently wreck your equipment. Electricity prices are higher in Israel than in America, and there is no cheap off-peak electricity like there is in Britain. You can save electricity and money using timers on appliances like heaters and water boilers and by using low energy bulbs. The Israel Electric office is in the new industrial zone.